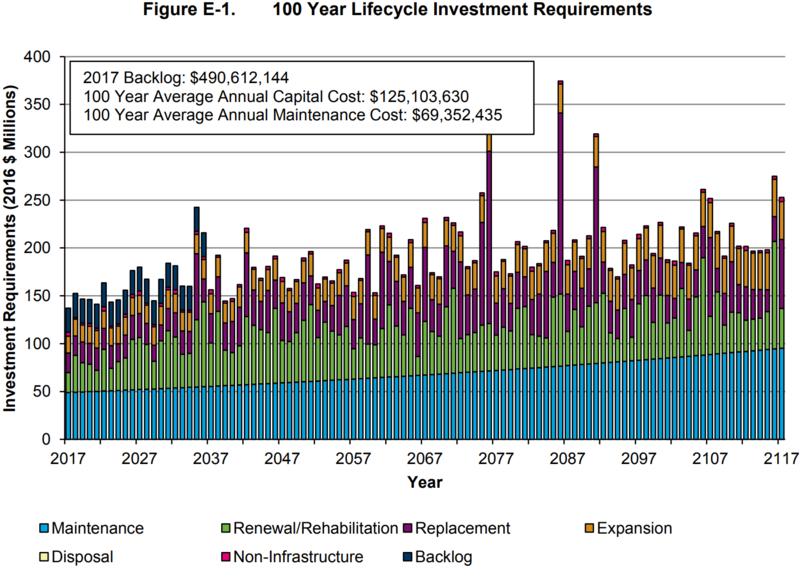 My organization has tasked me with copying a specific stacked bar chart (someone stumbled upon it on the web) in order to visually display information about 100 Year Lifecycle Investment Requirements. I'm not a data visualization expert by any stretch of the imagination, but I find myself being awfully critical of this stacked bar chart. Mainly, I find it incredibly difficult to glean meaning from it. But if you asked me to describe what the data actually means, I'd say: "well, I dunno, things seem to be going up over time". But other than that, even with the statistics in the top left corner, it doesn't seem to tell a simple enough story. Given the subject matter, is a stacked bar chart the best way to display the data? Or are there other industry standards/options that might be suitable alternatives? I think a stacked bar chart with this many values over such a long period of time is indeed not easy for readers to understand. Think about what is the message you're trying to convey with showing the graph. A graph visualization should have a message it's trying to tell to it's readers. Currently the graph has so many stories in one visualization that it's hard to grasp for readers. Separate bar charts for the values (one for maintenance, one for disposal, etc.). This way you show the increase, decrease in these values overtime. Same bar graph you currently have, without the stacks, just the total number. Consider the technique of breaking up larger and more complex blocks of information into more manageable chunks, especially if you want to untangle the difficulty of visualizing and understanding this type of information. Instead of a stacked chart you can easily plot multiple charts over the same axis, or create 'small multiples' which is basically creating smaller versions of single charts and grouping them for easier comparison. Not the answer you're looking for? Browse other questions tagged info-visualisation charts money or ask your own question.